Description This Douglasville, Georgia hotel has an outdoor pool, free internet access and non-smoking guest rooms. This hotel is also pet friendly. Easy interstate access free breakfast an outdoor pool and in-room refrigerators/microwaves earn high marks for the Econo Lodge Inn & Suites Douglasville from our guests. Each of the three-story Econo Lodge's 56 rooms includes a cable TV microwave refrigerator coffeemaker and free local calls. Non-smoking rooms are available; pets are permitted for a fee. Set your alarm to wake up for the complimentary breakfast. As for recreation there's a seasonal outdoor pool on site plus a fitness room. You'll also find a business center and laundry facilities on the premises. Parking is free. Located off I-20 the Econo Lodge is one mile from Arbor Place Mall. The Georgia Aquarium Zoo Atlanta Martin Luther King Jr. Museum and the World of Coca-Cola Museum are all 19 miles away. Hartsfield-Jackson Atlanta International Airport is 20 miles from the hotel. 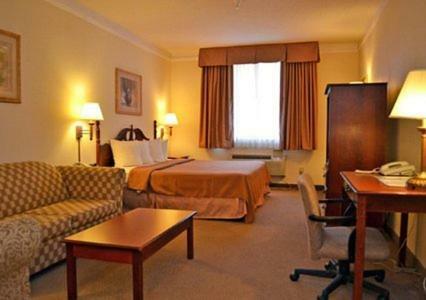 Add Econo Lodge Inn & Suites Douglasville to your free online travel itinerary.